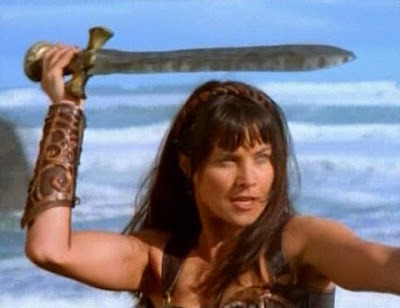 I began watching the second season of XENA: WARRIOR PRINCESS last night, and after seeing how good the season opener was (I had not seen it in about twelve years or so) I intend to make my way through as much of it as I can over the weekend before totally O.D.ing on adventures in the ancient world. I hope to have the full season overview/critique within about two weeks but it may arrive even sooner, so stay tuned! Actress Lucy Lawless is desperate to get back into costume as Xena: Warrior Princess - before she's replaced by a younger version. The New Zealander , 40, is back on TV as a madam in an upcoming episode of CSI: Miami, but it's another global hit she craves for - and a return to the fantasy series which made her a nerd pin-up. She says, "It'll have to happen fairly soon. If it takes much longer, they'll cast some 20 year old in the role and ask me to play the mother. I'd tell them to go to hell, or worse - I'd do it."